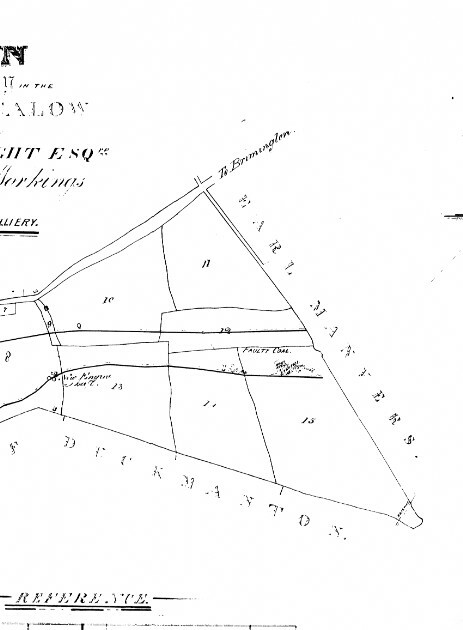 The first edition Ordnance Survey maps of the area from 1840 show several old shafts and coal pits in the village and its surrounding area. Some of these may well be dual purpose working for coal and ironstone. The seam worked was predominantly the Blackshale seam and the Yard seam on its basset from Brimington to Calow Green on the eastern edge of the Brimington anticline. 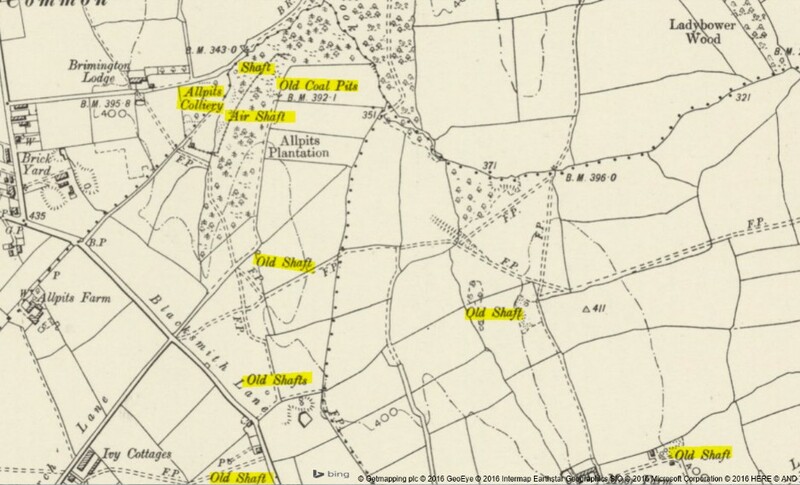 Old coal pits were sited in Allpits Plantation on the side of the Trough Brook and on both sides of Blacksmith Lane, the later Second Edition Ordnance Survey maps show more old shafts and Calow Colliery on Blacksmith Lane is abandoned. The following is an extract from the 1895 Bulmer and Company trade directory: 'The soil is various, blue and yellow clay and in some places very stony. Both coal and iron have been worked here for some time, and a blast furnace was operated here. There is reason to believe that sufficient coal remains to leave a margin of profit in working it and the experiment is now under trial by John Blair and Sons of Brampton at Allpits Colliery'. (Manager Henry Blair, Managing Director John Blair). Iron mining and smelting had taken place here at least since Roman times. To the east of Allpits colliery was an earlier mine which produced coal and ironstone for the Adelphi iron works, the minerals were transported by tramway from the pits to the works. This is shown on early one inch maps surveyed around 1830, the map also shows a static steam engine used to assist the movement of vehicles along the tramway. 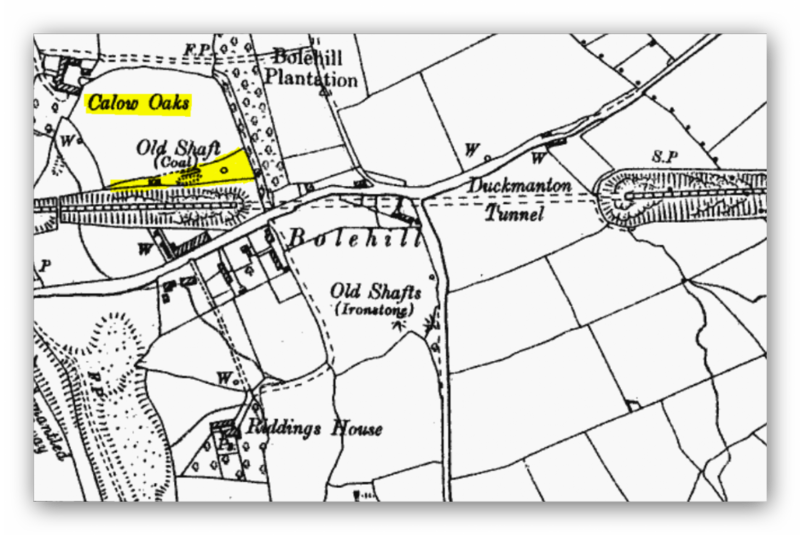 As we move south east along the anticline further collieries are in evidence, Calow Oaks colliery drift and shaft (1900). Then on to two collieries belonging to the Staveley company, Calow Old furnace shaft sunk prior to 1851 and Calow Main drift sunk in 1899. Two brick yards were built in Calow to supply the collieries in the nineteenth century one to supply Calow colliery on Church Lane (Back of the old Bextons butchers shop). The other on Blacksmith Lane supplying Allpits colliery. (The pond being the remains of the clay hole). To give some idea as to the size of the coal workings in Calow the following is the seam section from Calow Colliery in 1873. The early mineral railways used a system of wooden rails of oak with a wear strip on top usually of a hard wood such as beech that could be replaced when worn. Angular cast iron rails could also be used resting on small circular stones (allowing horses or ponies to walk between the rails), not unlike small mill stones. Holes were drilled into the stones which were plugged with lead or wood. Iron nails or pins could then be driven through the holes in the rail flange and then into the stone, thus securing the rail. One sleeper per side of rail. At the turn of the century the stone sleeper system was replaced by using wooden sleepers which supported two rails at right angles. Two such stone sleepers exist at the side of the stile across from Lodge Farm near to the site of Allpits Colliery. Across from the White Hart Public House is Lodge Farm. To the rear of the farm is the basset of the Tupton seam which was worked from the 1920's to the 1930's by a footril mine. 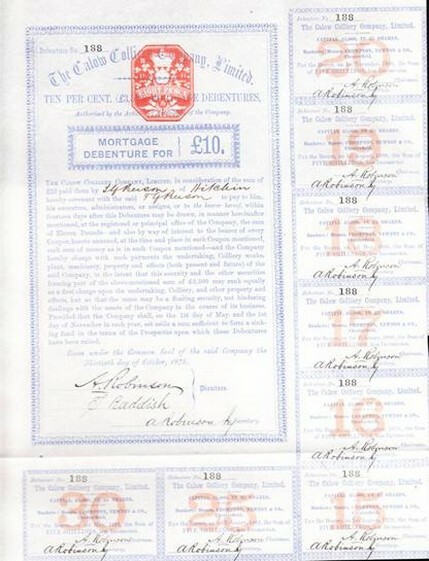 The abandonment dates are from 1926-1936. Presumably worked by the owners of the farm. Initially the colliery was worked early in the 19th. Century by two shafts to the south and adits to the north in the blackshale seam and possibly the deep soft seam. The workings were never more than 40 metres from the surface and the mine only worked around the basset edge of the seam which runs in a north south direction. It was later worked by Blair and Co. Of Brampton by three shafts and an older footril, the shafts being four, twenty two and twenty five yards deep into the Blackshale seam. The workings show abandonment dates of 1857, 1897 and 1922-1923. The colliery was put up for sale in March 1900. The colliery comprised of 16 acres of coal left to work with a seam of 5 foot 6 inches. It would appear that there were two collieries at different times working here. The later colliery working further down stream from the nature reserve site. Coal was carted on a small railway or tramway from the newer colliery possibly to the older colliery site and then away by road. The newer of the two collieries had shafts which were only six yards deep into the seam. The coal was worked between the two collieries. The abandonment dates are1922-1923. Sunk on land belonging to the Duke of Devonshire further south than Allpits colliery and worked by the Hardwick and Chesterfield colliery company, 68. Saint Helens Street Chesterfield utilising shafts of six (air shaft to east) and twenty three yards deep (to west) into the Blackshale and Yard seams as they split up. The seam dips at 1in 9. Workings abandoned 1873-1876. Thin seams of Cannel, Brunch and Sparkle Coal were to be found within the workings. Worked by a shaft and footrel, the shaft being eighteen yards deep to the Blackshale, Silkstone seam. The colliery was abandoned on 31st. July 1903, possibly as a result of being too close to the L.D.&E.C.Railway cutting and tunnel workings although the workings run away from the railway. A small section of coal was worked here. The colliery worked the Blackshale and Dog Tooth ironstone seams possibly from two shafts and was originally owned by Coke, Turner and company of Nottingham. The shafts initially ventilating Calow Main colliery of the Staveley company nearby, the colliery was abandoned by 1851. One shaft is in Calow Main yard area and the other is across the road in a field. Engine Shaft. One can presume this colliery was working prior to the plan being drawn up. There are also two more shafts at 41407120 and another at 41357130. Situated on Robert Arkwright’s land at Calow this colliery working the Ashgate and Blackshale seams. 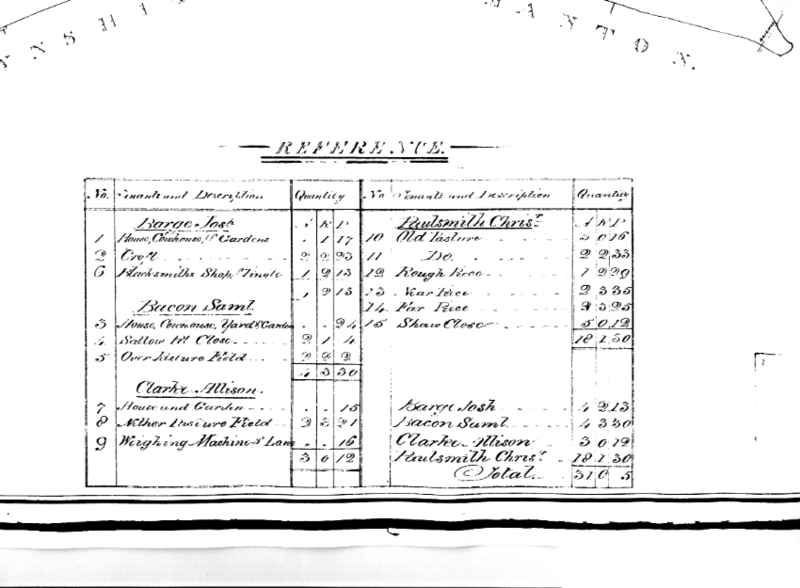 The plans for the colliery are dated May 6th 184? and were drawn up for the Arkwright’s by J. Richardson of Chesterfield. The colliery was abandoned in 1873. At an area near to SK 47/57 41427129 there are shown two shafts and a New Engine Shaft. One can presume this colliery was working prior to the plan being drawn up. There are also two more shafts at 41407120 and another at 41357130. Derbyshire Times. 27th. May 1876. 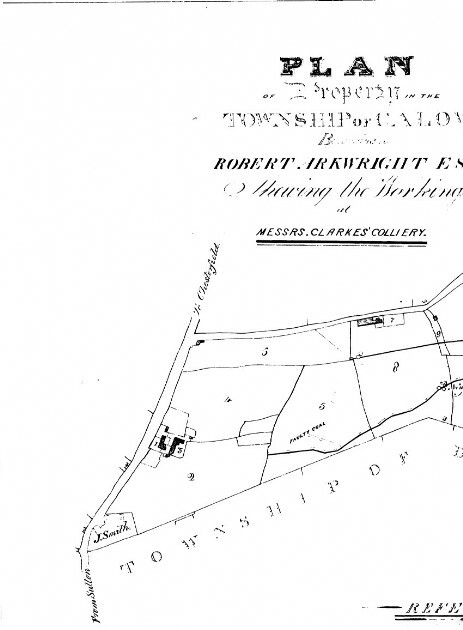 Calow Colliery Company will deliver to any part of the town best Silkstone 10/6 per ton, slack 4/6 per ton. Agent Mr. Joseph Rooth 9 Packers Yard Chesterfield. Valuable freehold land and minerals at Calow. To be sold by auction by J.Turner and Son. (by order of the mortgagees) at the Angel Hotel Chesterfield. Lot 1 Frogg Park, the Long Lea, Jenkin Wood Meadow, Middle Baggaley Close, Upper Baggaley Close. The Long Lea is arable and the rest is grassland. The Blackshale coal and Ironstone and other minerals, underlie all the lots except part of the Baggaley close. The timber will be included in the sale. The whole of the property was recently occupied by the late Mr. Jethro Adlington. Mr W.D.Botham has received instructions from the liquidator to sell by auction the whole of the valuable loose plant etc. 10h.p. engine, mortar and clay mills and pans, two pit water tubs, pit cage, 2 pit wagons, 6,000 pressed bricks and 3,000 common bricks. A small colliery for sale. 15-16 acres of good coal to work at Calow. Good sale for coal and good reason for giving up. John Blair of Brampton. Coal 5' 6".